Most people believe that diamonds are colorless. The truth is that there are diamonds of every color in the rainbow. 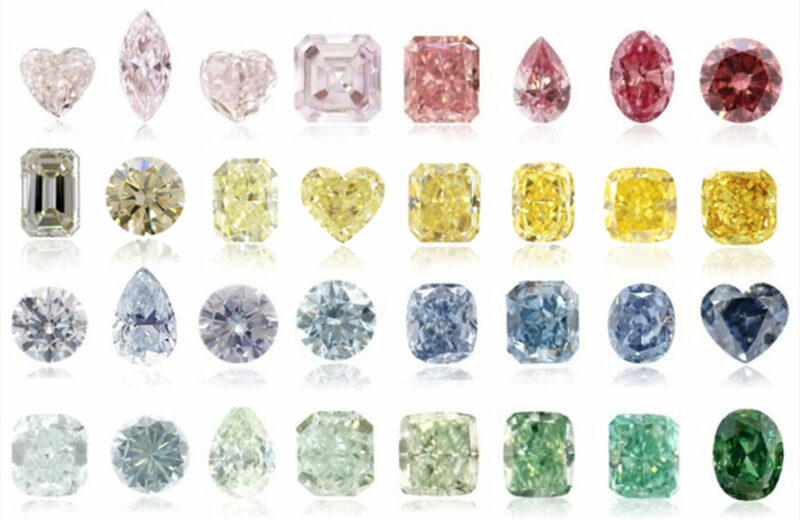 From the rarest – red, blue and pink, to green, purple and black – fancy color diamonds are often considered to be more valuable than their colorless brothers, and the demand for these stones seems to be growing every year. What’s there to know about color diamonds and how to choose the stone to enjoy a return on investment measured in hundreds of percents? Read on to find out. Fancy color diamonds are exceedingly rare, highly prized by connoisseurs and experts alike and highly regarded by the investors. The estimates project that for every seventy thousands of extremely rare colorless D (color) and IF (clarity) diamonds there’s only one fancy color diamond. Top-grade blue or pink diamonds can increase their value by over a hundred percent in a matter of five or six years after the purchase. The reason for such high returns is also the fact that natural deposits of color diamonds are close to depletion. According to the 2014 report by Rio Tinto, the owner of Argyle mine which is responsible for the mining of 90% of all the pink diamonds in the world, the complete depletion of deposits in their mine may occur as early as 2018. It is very likely then that the prices of pink diamonds may, once again, rise sharply. Just like with colorless diamonds, the basis for color diamond quality appraisal is the 4C rule (find out more about the 4C rule here), but it’s the color that has the biggest bearing on the value. What factors are taken into consideration and how are they measured? Color grade is a very complicated component of the overall grading process because in case of fancy color diamonds there are multiple parameters to be considered: not only color itself but also its tone, saturation, and even color distribution all over the stone. All of these contribute to the stone’s uniqueness. The strength and saturation of the color are graded according to an eight-level scale of saturation: from the weakest faint to very strong and intense fancy deep. The stronger and more vivid the saturation, the more unique a diamond – and that drives the price up. Distribution is a parameter that tells us how even the color is spread and about the presence of different colors within the stone. The intensity of another color or colors that “accompany” the main hue has a huge influence on the beauty of the stone. Stones that exhibit uniform color and deep saturation (e.g. fancy red, fancy intense blue) are the most valuable. However, highly valuable stones can be also found among stones combining two colors, like pink and purple or blue and green. Despite the dual color distribution, they still command high prices because of the presence of pink and blue hue which occur in nature only very rarely. While choosing diamonds as a goal of an investment it is good to remember that the choice of the trusted partner is a cornerstone of successful transactions. It is especially important when dealing with fancy color diamonds which sometimes may have been “enhanced” and their color achieved artificially. Such stones are subjected to extremely high pressures, which alter their color (HPHT method). They usually cost a lot less – the low price may often be a hint that the stone was tampered with. To make sure that the purchased diamond is 100% natural it is best to choose stones certified by renowned gemological labs. All diamonds sold by Mart Diamonds are certified by GIA, the biggest and most influential gemological institute in the world. Since 2018 we’re also cooperating with FCRF (Fancy Color Research Foundation), an association of fancy color diamond companies devoted to supporting the worldwide diamond trade. We’re continuously expanding our knowledge and contacts to offer our customers excellent diamonds at the best prices.